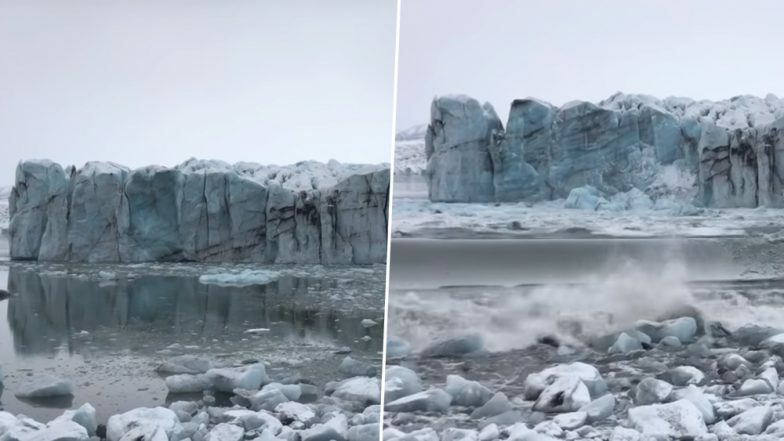 Video of a huge chunk of ice breaking off from Iceland glacier has gone viral on social media. The incident happened at the Breiðamerkurjökull glacier is located in southeast Iceland on Sunday. The Nordic country's lagoons are a popular tourist spot and video shows people running away as the ice blocks come tumbling down. The clip shows groups of people clicking photographs standing on rocks, only to hear a cracking sound. Reportedly, there were 14 tourists at the time of the incident. The ice came falling into the water causing a big wave pushing waters over the icebergs where the people were standing. People can be heard screaming and running as the glacier breaks off. Fortunately, nobody was hurt and people made it safely out of the place. Stephan Mantler, a mountain guide who was present during at the spot during the incident told AccuWeather the entire scene was quite dramatic. Shocking Environmental Report says Himalayas Could Lose Two-Thirds of Glacial Cover this Century. According to a Reuters report, around 90 years ago, Jökulsárlón Lagoon appeared when the Breiðamerkurjökull glacier began to melt. The lagoon has since become the country's deepest lake, the report continued. Scientists have warned that Breiðamerkurjökull and the glaciers around it are retreating and could completely disappear in around 200 years.